Sport Court Carolina can build the outdoor court of your dreams. Choose the surface for your court, the sports you want to play & the colors you want, then just add options such as court lighting, ball containment fence, sports equipment and more including custom logos to make it your court! 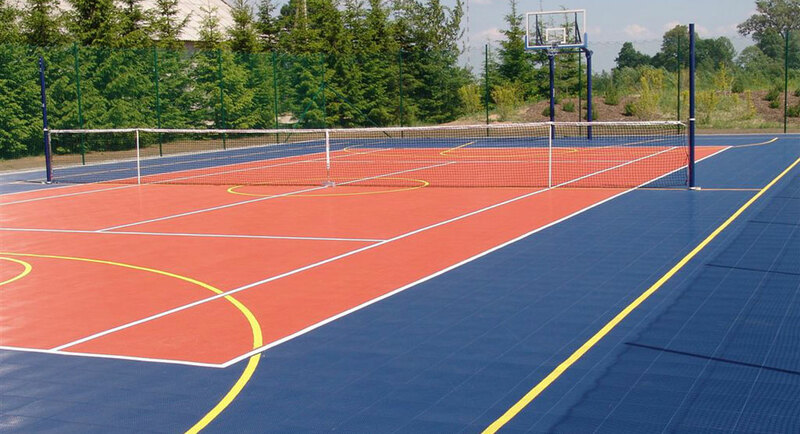 Sport Court surfaces reduce injures to knees and back with excellent shock absorption at the point of contact. Sport Court performance flooring helps to control the downward and horizontal surface movement where the athlete contacts the floor. This is particularly important during the competitive play. The stop and go characteristics of sport court performance flooring provides the ideal amount of friction for all recreational activities. Sport Court surfaces have consistent, true ball bounce and sound resulting in the highest performance of a synthetic court. With proper pneumatic wheel carts, sport court performance flooring can handle the rolling load requirements facing virtually any gym or multipurpose area. Contact us to tell us what is on your mind because there are endless possibilities. We custom build every court to fit your facility, your budget and sport.